Today has bean so hard as I have bean sorting out my little dog Sandys things. Its a job I have put off doing but where they are kept was also hard seeing them every day. I am still feeling so lost. I am thinking about getting another dog later on in the year. Am I wrong to try to replace her? Later on in the day I knocked my right shoulder (RSD side) on the door frame my balance is not always good. I did not think too much about it till later on, when I looked it had taken all the skin off and was very red. Not a good night a lot of spasms and pain. I think is is because I knocked my shoulder and the nerves have picked up on it. The pain seemed to be all the right side. Not much sleep. But on a good note I think my ribs are on the mend. Physio at last. Wietse is now back and is his usual self. I told him about the extra pain I have bean having. The extreme temperature changes that seemed to have got worse and longer lasting. He also asked me about Sandy I said I was totally lost with out her. He said that would not have helped the RSD much. He did usual needles I hope this will improve things as I now know that the acupuncture works as when I don't have it I am worse. I asked him about when I could think about running again he said give it a few more weeks as my ribs went though a lot. He thinks my balance is due to me walking different, more straighter so my center of balance is off till my body gets used to the change again. I think he could be right. As I am walking a lot better than I was. Tonight Paul and I are attending the running clubs BBQ, two of my running friends are hosting it at there house. The night does not look too promising with the weather but we can only hope it does not rain. The food was good especially the cakes. One of the members Tim is doing a seventy mile run while juggling balls for RSPCA charity. We all wish him good luck and we sponsored him. He was practicing but I think had a few too many beers and kept dropping things he also juggled with knives, very impressive. The night was a good one and did not rain. So thank you Ross and Paul. I helped Paul re-felt the shed some thing he has bean putting off. The day is very hot. First we had to scrape off the old felt which he had stuck on with LOTS of adhesive it took a lot of getting off. Paul and I then put on the new felt, I had to be care not to over reach and upset my ribs again. A few hours later and the job was done. My shoulder looks like it has bean grated with a metal cheese grater its very swollen and red. There is lot of yellow pus coming out probably infected. I will not go to the doctors now but will wait to see if it gets better on its own less antibiotics the better. The pain is worse that it was. I have keep redressed it as the blood keeps coming though. I am out today with my next door neighbour she is taking me to a cinama at Woohall Spa, about a hour traveling. 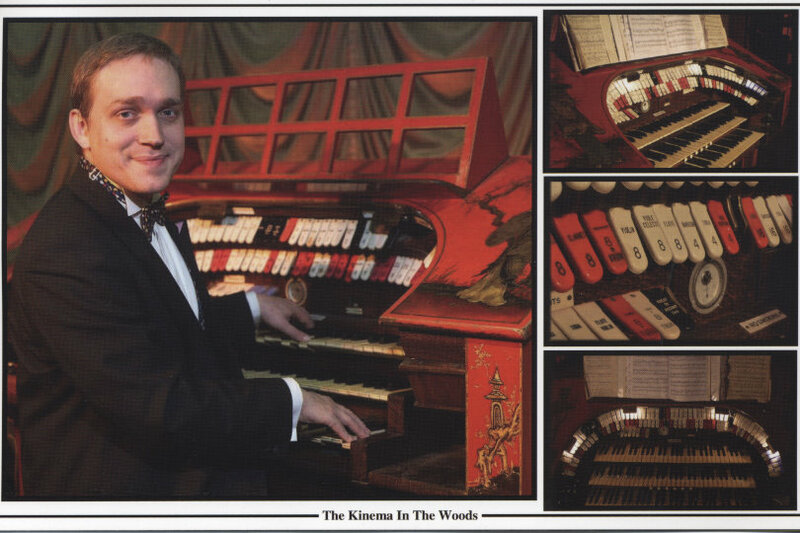 Kinema in the woods, as it is called for Down Memory Lane a look back at the 40s, 50s and bygone years. We saw very old clips of bygone stars/actors some I did know you they were, some from war time actors and singers. We had a sing along to the song. An organ came up out of the stage, a Compton one, it was amazing. 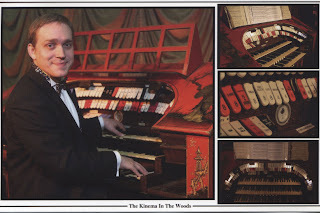 He played very well, my Dad used to play most types of organ or panio plus other thing. so as I grew up there was always music of one type in our house. I enjoyed it a lot. After it was at an end we went for tea and cakes, homemade, they they were very good. We were full so we started for home. It was a lovely day out a nice surprise. thank you Cilla. Physio usual needles some of them hurt more that usual. I told him about the intense burning I have bean getting in my legs mostly, its bean worse the last few nights. I put my foot out of bed only for it to get very cold and go into spasms and wake me up. He said I am afraid thats RSD. I feel very stiff and have a lot of joint pain but I think that to do the travel yesterday and sitting for the bygone film. My daughter and the boys are here for the day. Andrew and I bought them a pirate set each so they are having great fun play at pirates. Walking the plank and sailing in a pretend ship and sword fighting. The day is hot again. A few hours later two tired boys and one tired nanny. They head off home leaving me in peace. Another rough night with spasms and burning. Maybe over did it yesterday as doing a lot of sorting out and felt very tired when I went to bed but no better sleep, worse. I am in town today on my scooter for the first time since I cracked my ribs as was advised not to go on it till better. All the children are off school so its very busy. I got want I needed so I was pleased. The scooter did not upset the ribs too much so they must be just about better. My shoulder is a lot better and now looks good and not infected but still sore I have to be careful I don't knock it again. I have bean busy sorting out more cupboards we are going to have a carboot, hopefuly next month. We have a lot of things that have bean stored, so now is the time to get rid of them. Later in the evening I am having of lot of pain in my joints. Most of it is my RSD side but some is on my other side. The pain is very deep and how ever much I try to get in a comfortable postion I cannot. I have my bath to see if that will help. Bed at four am. I try to get comfortable about an hour later I fall asleep. At doctors as I need to see him as I think I have an infection in my leg where I got bitten by a Bug. He looked at the bite and told me it was a nasty infection. He has put me on ERYTHROMYCIN 250mg four times a day. If things dont improve I am to go back as there is a risk of septicemia. Its all ways the RSD side that gets things wrong with it. I told him about the pain in my joints/muscles. He thinks its the Fibromlgia is playing up. The RSD was not too bad but is picking up on the extra pain. I had hoped to reduce my pain relief this month but we both agreed that is not a good idea. Wietse did his usual needles he put in a few extras ones to see if it will help my other pain in my joints. I told him about the temperature changes that have not improved at all. In the afternoon Jordon (Katie Price) was in town so I went and got a book signed for my son Wayne for his Birthday. I was able to go in at the front of the queue as being disabled. I still had to stand in line the same as every one else but not for as long. Some people had bean standing there since 4am. She was not expected to arrive till 5pm. A lot of people were getting very exectied and I got pushed a few times and was scared I was going to get knocked down.I felt very shaky and dizzy. My time came to go in. I was taken in side where I sat down and was given a drink, I soon felt a lot better. It was worth it as Wayne was very pleased if not a little shocked. With my books signed (I got one as well). And a very quick view of Jordon. I was on my way home I felt drained and in pain but it was worth it. My doctor and Wietse says it will be alright to start running again as my ribs are healed now. So that is the best news that I have had for a while. I was always told that there is gold at the end of the rainbow may be there is . May be things will start to look up at last. I hope your world is stable at the moment and your health is as good as it can be.